On April 13th we will be undergoing scheduled maintenance on our website. You may not be able to access your accounts between 2:00pm-4:00pm on April 13th. We aplogize for any inconvenience this may cause. Sign up and receive a text message or e-mail when your card is used. Set custom alerts on any account to notify you via phone or email. Why go paperless? Convenience! Statements are available as soon as they are produced. Union State Bank was started on April 23, 1901 by a group of investors that included L.E. Holt. From that day through the present, Union State Bank has been owned and managed by L.E.’s descendants. But we don’t expect that being family-owned and operated for five generations is a reason why people should bank with us? Anymore, a person can get banking services nearly anywhere, so we work hard to provide the best banking experience you can get. How? It starts with treating everyone like they are the most important customer we have. Then, we work hard to keep our fees at a reasonable level and, in many cases, we’re the lowest in our market – sometimes by a lot! Finally, we believe that our bank will be as successful as the communities in which we live and work, so our employees are active as volunteers in many different facets of those communities. We hope you will give us a chance to earn your business! 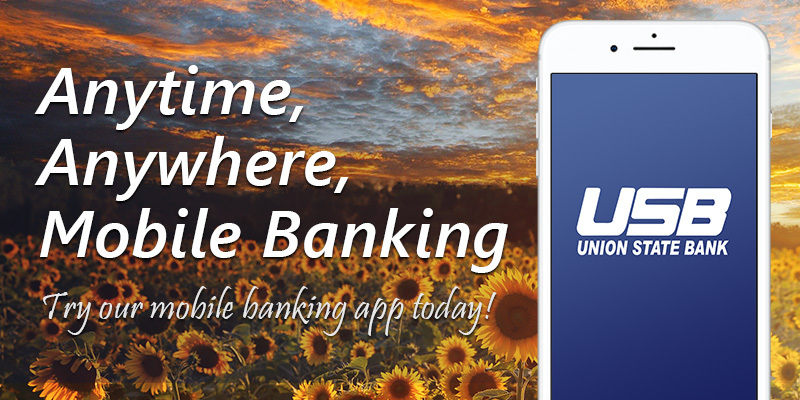 We think you’ll like the difference at Union State Bank! Find out what the Union State Bank can do for you here.